Either one of these teams could easily go to the Super Bowl this year. Both have a 6-2 record and are playing great football. Both teams have good quarterbacks that are playing well accompanied by tough defenses. The only seeming blemish is New England’s inexplicable loss last weekend to the Cleveland Browns. Nobody expected the Browns to smash the Patriots in the mouth, but they did. Both of New England’s losses came away from home this year, so this game presents a unique challenge. Pittsburgh has looked very tough with the return of their star quarterback Ben Roethlisberger. Never a flashy team, Pittsburgh always seems to get it done. Expect this week to be no different. Pittsburgh will win, but in a close one at home. If this game was in New England, I would have picked the Patriots. Its also important to note that I’ve been a disaster picking winners this year, and with this one looking close, simply my selection of the Steelers may make you want to place some bets on the Patriots. Its OK, I understand. Apparently, Washington Redskins coach, Mike Shanahan, pulled Donovan McNabb out of a late game situation two weeks ago because he would have “cardiovascular” issues. Or it may be that he didn’t have a grasp of the two-minute drill. Both were Shanahan’s excuses and both sound like mounds of male bovine fertilizer. Nobody really knows why he did it, but you can bet McNabb was embarrassed and doesn’t want that to happen again this coming Monday Night against his old team, the Philadelphia Eagles. The Eagles come to town with their quarterback Michael Vick playing excellent football. Vick has seen a bit of a resurgence in his career since he joined the Eagles following his prison term for dog-fighting. Last week, after the Eagles victory, many experts commented that Vick is playing the best football of his career. Head Coach Andy Reid saw the same thing, considering he benched his original starter in favor of Mike early in the season. The Redskins aren’t playing great football lately. They are 4-4, but all four of their wins have come by less than a touchdown and against mediocre teams. One of those wins did come at Philadelphia, but it was when the Eagles were injury laden. On the other hand, the Eagles have beaten two quality teams in the last three weeks, the Falcons and the Colts. Both were convincing wins, not accidents. Look for the Eagles to continue their play this weekend in DC, giving the Redskins their 5th loss. 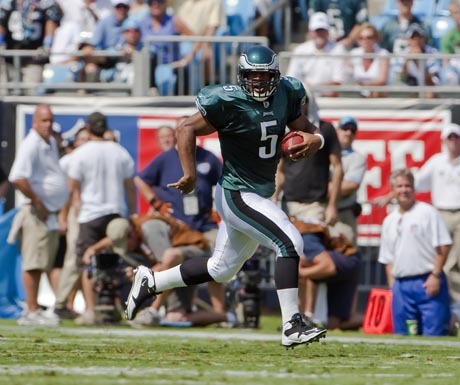 One Liner: “McNabb wouldn’t be so tired in the 4th quarter if he wasn’t running for his life the whole game?” Referring to head coach Mike Shanahan’s decision to bench McNabb during a 2 minute drill because of this level of physical fitness.